entrepreneur | Bolton Hill Consulting, Ltd.
Timothy “Scott” Case is a technologist, entrepreneur and inventor and was co-founder of Priceline, the “Name Your Own Price” company that was one of only a handful of startups in US history to reach a billion dollars in annual sales in less than 24 months. As Chief Technology Officer, he was responsible for building the technology that enabled Priceline’s hyper-growth. Register Before March 26, 2011! The Startup America Partnership is itself a startup, which has received support from the Kauffman Foundation and the Case Foundation. Our keynote speaker will be Scott Case, the recently named CEO of the Startup America Partnership . Join us for an evening of dinner, networking, and a program celebrating entrepreneurial innovation! Get in on the ground floor as this innovative public-private partnership develops resources for emerging companies and raises awareness of the critical role that entrepreneurs play in job creation and economic growth. Our venue for the event is the stunning French Embassy .The dinner fare will be a delightful buffet of French cuisine favorites, and will be paired with wine before the presentations and dessert after. The cost is $85.00 for non-members and $45.00 for members. Idea Explorer | MIT World. This WONDERFUL WATERFALL OF WORDS reflects the range of ideas and concepts discussed at the Massachusetts Institute of Technology. In keeping with the MIT tradition, the word count is infinite, as new words and ideas are added every day. Want to brainstorm? Go to the site and click on an idea and watch a video on the topic. The MIT Enterprise Forum (MITEF) of DC & Baltimore’s 2010 Gala on February 18, 2010 was an event to remember for 150+ small and medium entrepreneurs and the larger companies, VCs, Angel Investors and service providers who support and mentor them. In a town where skepticism is rampant and who you know sometimes seems more important than what you know, the MIT Enterprise Forum of DC and Baltimore refreshingly brought together inspired professionals with knowledge, leadership and hope for the future to talk about international cooperation in launching and growing science based technology businesses. 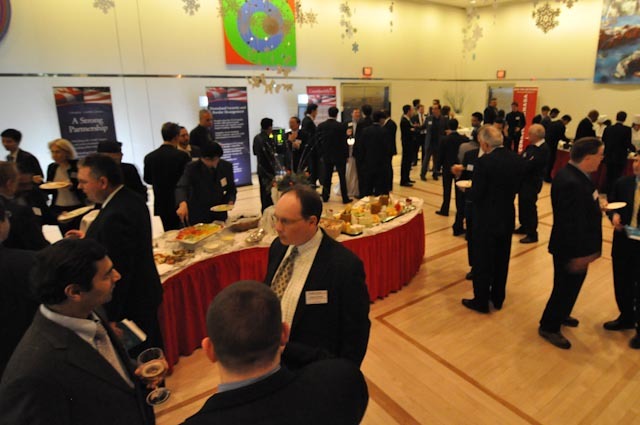 The Gala was held at the beautiful Canadian Embassy on Pennsylvania Avenue and it marked MITEF’s first DC based event. The glass windows of the Embassy looked out onto the Capital which provided a terrific backdrop for the distinguished gathering. One hundred and fifty entrepreneurs, scientists, venture capitalists and service-providers spent three hours mingling and eating, listening and asking questions of two fascinating keynote speakers with first hand knowledge about policy and the investment realities for Canadian and American businesses. This year’s theme was “Growing Opportunity for Technology Entrepreneurship in Domestic and Emerging Markets: The Role of Innovation in Economic Development” and was chaired by Patrick Mellody, a Director on the MITEF Board. 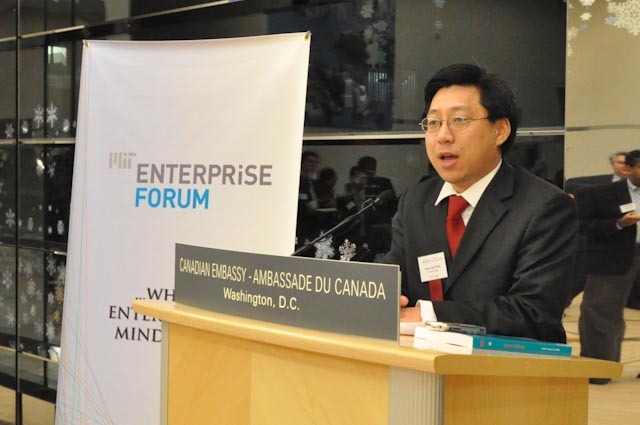 Jean-Luc Park, the MITEF Chairman and an Associate at the Calvert Fund moderated. The two keynote speakers were Jean-René Halde of the Business Development Bank of Canada & Phil Auerswald, founder and co-editor of the MIT Innovations Journal (along with Iqbal Quadir, Founder of Grameen Phone) and Associate Professor at George Mason University. The question and answer period went on for 30 minutes which indicated that people were truly engaged with both Jean-René Halde and Phil Auerswald. Jean-René Halde’s visit with the MITEF was part of a larger business trip to the United States. Mr. Halde told the crowd that he was enjoying his trip and had enjoyed productive meetings with the heads of several private and public American institutions in Washington, DC. As CEO of the Business Development Bank of Canada, Jean-René’s primary goal is to invest in and promote entrepreneurial activity in Canada. He does this with tremendous support from the Canadian government. 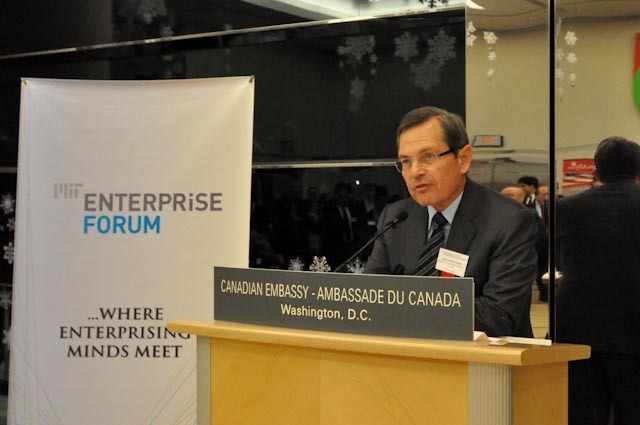 He is enthusiastic about the many successful entrepreneurial partnerships between American and Canadian companies. Mr. Halde also shared what he believes are new opportunities in a difficult economic environment. Mr. Halde ended the evening by showing his Canadian pride as this year’s sponsor of the Olympics. He generously awarded several pairs of red mittens adorned with the Olympic symbol to several lucky attendees. Phil Auerswald came to the Gala hours after meeting with leaders at the Clinton Global Initiative in New York. 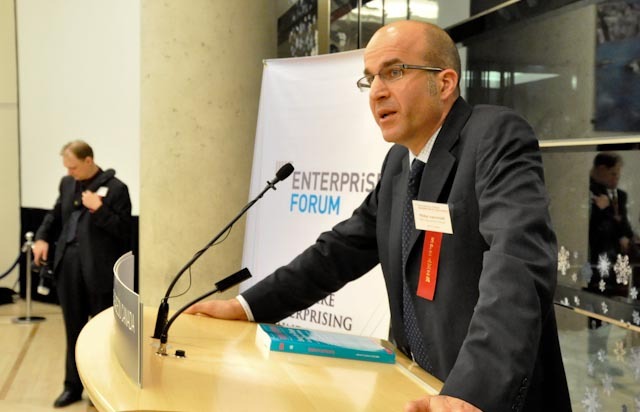 Mr. Auerswald brought a fresh new perspective to the MIT Enterprise Forum. He asked entrepreneurs to think globally as they create new entrepreneurial partnerships and establish new markets for their products. He asked them to engage foreign nationals to learn more about partnership opportunities in international markets. He also asked entrepreneurs to become more politically involved to protect their interests and grow their range of opportunities both at-home and abroad. 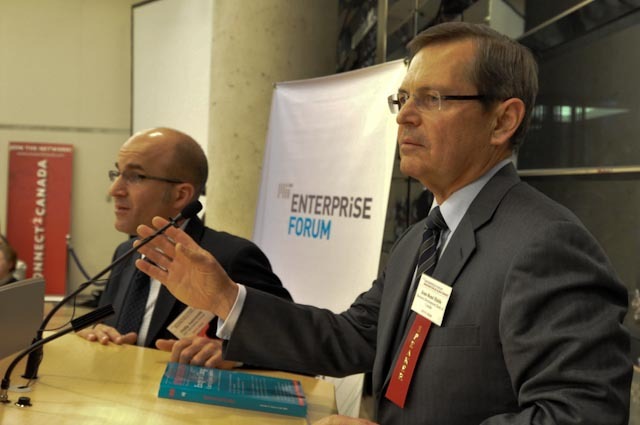 Open to all since 1981, the Enterprise Forum® has promoted the growth, education, and success of the entrepreneur and business community of the greater Washington & Baltimore area. The MITEF is a non-profit, volunteer organization, it provides exceptional quality events that are open to the public. Its many programs are targeted to local start-ups, high technology businesses, venture capitalists, angels, and the professionals who support them. The DC chapter is one of a network of 24 worldwide chapters of the Enterprise Forum , which was created as an outreach educational program of the Massachusetts Institute of Technology (M.I.T.). Participation and membership by the general public, regardless of their affiliation, is encouraged. The Author, Halima Aquino, is a Director on the Board of the MIT Enterprise Forum. She was also last year’s Gala Chair and this year’s Vice Chair. Halima is the Founder of Bolton Hill Consulting and Clean Tech Market Maker. Goldman Sachs is aggressively seeking market making opportunities in environmental markets. The policy framework that they have laid out explains both their investment strategy and an underlying commitment to protect the environment and indigenous populations. Their specific interests in wind, water, solar, alternative biofuels and sustainable forestry related products are detailed below along with references to existing partnerships and hints of future commitments. Goldman Sachs will aggressively seek market making and investment opportunities in the environmental markets described below. They intend to be a leading U.S. wind energy developer and generator through their recently acquired subsidiary, Horizon Wind Energy (f.k.a. Zilkha Renewable Energy). They will make available up to $1 billion to invest in renewable energy and energy efficiency projects. They will evaluate opportunities and, where appropriate, encourage the development of and participate in markets for water, biodiversity, forest management, forest-based ecosystems, and other ecosystem features and services. They will continue to devise investment structures for renewable energy and invest alongside our energy clients, such as our wind energy partnership with Shell Wind Energy and our solar energy fund with BP Solar. They will explore investment opportunities in renewable and/or cleaner burning alternative fuels such as renewable diesel (such as our investment in Changing World Technologies), ethanol and biomass. They will seek to make investments in, and create financing structures to assist in the development and commercialization of, other environmentally friendly technologies. Any project or initiate loans where the specified use of proceeds would significantly convert or degrade a critical natural habitat. Projects that contravene any relevant international environmental agreement which has been enacted into the law of, or otherwise has the force of law in, the country in which the project is located. Develop due diligence procedures around key environmental issues for use in evaluating potential financings. Protect the highest conservation values in forests with respect to its execution of financings in the logging and forest products industries. Use a Forest Stewardship Council or a comparable certification when they finance forestry projects that impact high conservation value forests. Examine whether clients process, purchase, or trade wood products from high risk countries and will encourage such clients to have certifiable systems in place to ensure that the wood they process, purchase or trade comes from legal sources. Provide training, as appropriate, to our employees on environmental issues and practices. Develop training sessions and provide the tools necessary to make informed decisions. Finance projects in indigenous areas where free, prior informed consultation results in support of the project by the affected indigenous peoples. China, the world’s largest polluting nation, is working with international organizations and private industry to develop cleaner energy models to combat climate change and meet demand for power in an economy that expanded 10.7 percent in the fourth quarter 2009. By 2020, China aims to use 10 million tons of bioethanol and 2 million tons of biodiesel, replacing 10 million tons a year of petroleum-based fuel, Chen Deming, vice chairman of the National Development and Reform Commission, told a news conference. The companies described here are not meant to be a complete list of Chinese companies engaged in clean energy nor is Bolton Hill Consulting, Ltd. making any specific recommendations with respect to these companies. The descriptions are provided here for information purposes only to help companies unfamiliar with China’s clean energy interests to better understand the rapidly changing landscape and some of the pivotal players in China. The companies described below are powerful in China or have shown rapid growth. They may be working with American and European companies or they are likely to do so in the near future. These companies are acquiring foreign companies, setting up subsidiaries, developing new technologies and making innovative use of existing technologies. The CRESP program was developed by the Government of China (GOC) in cooperation with the World Bank (WB) and the Global Environment Facility (GEF). Together, these entities have been implementing the Renewable Energy Scale-up program for China which aims to create a legal, regulatory, and institutional environment conducive to large-scale, renewable-based electricity generation in two Chinese provinces. The Institutional Development and Capacity Building component includes: Mandated Market Policy MMP research and implementation support; technology improvement for wind and biomass; and long-term capacity building. In Fujian, a 100 MW wind farm at Changjiang’ao, Pingtan Island. The Pingtan wind farm will consist of wind turbines, associated civil and electrical works, an extension to an existing control room, a switchyard, and a 15 km, 110 kV transmission line from the wind farm to the Beicuo substation, which will be upgraded to meet the evacuation needs of the wind farm. In Jiangsu, a 25 MW straw-fired biomass power plant at Mabei Village, Rudong County. The Rudong power plant will consist of one 110 ton per hour, high-temperature, high-pressure strawfired boiler, one 25 MW steam turbine, and associated mechanical, electrical, and civil works. The company may be planning to take its wind power unit public in a Hong Kong share sale this year worth at least $1 billion, said people familiar with the plan. The company is rumored to have hired China International Capital Corp, Goldman Sachs Group Inc, Macquarie Group Ltd and Morgan Stanley to arrange the initial public offering. “The Group” is active in developing new clean technologies and leads the country not only in design of conventional thermal power plants, transmission and substations. The Group Corporation has also carried out widespread international exchange and cooperation with many foreign enterprises groups and engineering companies. The Group Corporation plays leading role in scientific research, standardization and technical information for power survey and design, undertakes new technological research and development, introduces, assimilates and innovates new technologies. China Southern Power Gird Corporation is administered by the central government,with independent budgetary status.The total assets of the new power gird operator surpass 203.8 billion yuan(US$24.10billion) and its registered capital is 60 billion yuan (US$7.23billion).Its main responsibilities are:to operate and manage power gird according to the law,ensure reliable power supply,plan the development of regional power gird,foster regional power market,manage power dispatching and trading center,and carry out power dispatching according to power gird operation laws and the market regulations. China SDIC Power’ takeover of power assets from its controlling shareholder, State Development and Investment Company, for a consideration of RMB 7.69 Bn. After the transaction, SDIC power assets achieved a whole listing. This deal was the largest capital injection to a listed company by its controlling shareholder in 2009, and the largest capital injection of power assets ever. Along with the commission of a number of key power projects, such as cascade hydropower stations in the Yalong River Valley and Tianjin million-kilowatt extra supercritical thermal power station-a pilot project of circular economy, the total installed capacity of SDIC will reach 50000 MW by 2012, with total assets of SDIC’s power business exceeding RMB 140 billion. Chinese wind power capacity doubled for the fifth time by end of 2009, to 25.1 gW by the end of 2009, a third of the global additions in the previous 12 months, according to the Global Wind Energy Council. 5. China Longyuan Power Group Corp, China’s Biggest Wind-Power Producer in December raised HK$20.1 billion in the world’s second-largest alternative energy initial public offering (IPO) since at least 1999, according to data compiled by Bloomberg. 6. Xinjiang Goldwind Science & Technology Co 002202.SZ,: Growing Chinese Wind Generator Manufacturer- The Group’s principal activities are manufacturing, marketing and selling large-sized wind generator sets. Other activities include introducing and applying wind generating technology; manufacturing and selling parts of wind generating sets; providing consulting services in building and operating wind generating plants; building and operating middle-sized wind generating plants. This company is already listed in Shenzhen, aims to raise $1.5 billion from a Hong Kong IPO in the first half of this year, sources told Reuters earlier. By 2020, China aims to use 10 million tons of bioethanol and 2 million tons of biodiesel, replacing 10 million tons a year of petroleum-based fuel, Chen Deming, vice chairman of the National Development and Reform Commission, told a news conference. “In the future, all the biofuel production will use non-grain crops,” Chen said. 7. China Clean Energy (OTCBB:CCGY) : develops and manufactures biodiesel and environmentally-friendly specialty chemical products made from renewable resources through its subsidiaries, Fujian Zhongde Technology and Fujian Zhongde Energy. It’s new plant (Oct. 2009) has been designed to produce up to 100,000 tons of biodiesel annually or a combination of as much as 40,000 tons of biodiesel and 30,000 tons of specialty chemicals. Along with the commission of a number of key power projects, such as cascade hydropower stations in the Yalong River Valley and Tianjin million-kilowatt extra supercritical thermal power station-a pilot project of circular economy, the total installed capacity of SDIC will reach 50000 MW by 2012, with total assets of SDIC’s power business exceeding RMB 140 billion. 10. SDIC HUAJING POWER HOLDINGS CO.,LTD. 11. ERTAN HYDROPOWER DEVELOPMENT COMPANY,LTD. 12. SDIC YUNNAN DACHAOSHAN HYDROPOWER CO,LTD. 13. SDIC QINZHOU ELECTRIC POWER CO.,LTD. 14. JINGYUAN SECOND POWER CO.,LTD. 15. GANSU XIAOSANXIA HYDROPOWER DEVELOPMENT CO.LTD. Innovate and Enter / Participate & Launch! The next Solar Decathlon will be held in Washington, D.C., in the fall of 2011, when once again teams from colleges and universities from around the world will gather to compete. The request for proposals (RFP), RFP amendments, and draft rules for the 2011 competition are available by clicking the link above. 2009 Competition: DOE Solar Decathlon: 2009 Final Results. For three weeks in October 2009, the U.S. Department of Energy hosted the Solar Decathlon—a competition in which 20 teams of college and university students competed to design, build, and operate the most attractive, effective, and energy-efficient solar-powered house. The Solar Decathlon also enabled the public to observe the powerful combination of solar energy, energy efficiency, and the best in home design. Oct. 19-21—Teams disassembled their houses. The final results of the U.S. Department of Energy Solar Decathlon 2009 are presented below. The 2009 Solar Decathlon was held Oct. 9-18 on the National Mall in Washington, D.C., and challenged 20 student teams to design, build, and operate the most attractive and energy-efficient solar-powered house. The 2007 champions did it again! Team Germany focused on producing surplus energy by using the maximum overall building dimensions allowed, applying photovoltaics to every available surface, and pushing the envelope with new technologies. The team walked away with the Net Metering contest and performed well in several others, including Architecture, Lighting Design, Comfort Zone, and Hot Water. Demonstrating that they are true champions, members of Team Germany were extremely gracious in their victory and recognized the work of their peers. Gable House was one of the first to be assembled and ran like clockwork the entire competition. The team set out to express its regional heritage and sought to create a synergy between old and new. Traditional techniques in homebuilding, along with great advances in technology, blended to create a house that performed exceptionally well in energy efficiency—as demonstrated by the team’s results in all the objective contests. Focused on performance, this team also achieved elegant simplicity in design. A winning spirit guided this team throughout the 2009 competition. Ranking in the top three of nearly every contest, Team California also excelled in some of the most prestigious subjective contests. It finished first in both the Architecture and Communications contests, achieved second in Engineering, and tied for third in Market Viability. Beautiful in every respect, Refract House broke out of the box and masterfully executed the melding of interior and exterior spaces while offering a consistent and high-quality learning experience to visitors. The panel of judges and jurors assembled to evaluate the 20 U.S. Department of Energy Solar Decathlon 2009 teams and their houses is composed of individuals at the top of their professions. Renowned in their fields of study, they bring academic excellence and practical, in-the-field expertise to each of the 10 contests. Their involvement in the Solar Decathlon will help advance energy efficiency and renewable energy throughout the world. Using objective and subjective measures to evaluate the team houses, the jurors assign points for every contest that determine each team’s overall score and standing. Kevin Burke works closely with William McDonough to give form to the eco-effective design principles on an array of project types and scales at William McDonough + Partners. He served as co-designer on several of the projects that have become known as milestones in American sustainable design. His approach is driven by his keen interest in place-making through integrated design solutions. Burke currently manages the 40-person practice, which opened a second studio in San Francisco in 2006. He is a key design leader, heading teams on Fuller Theological Seminary’s Worship Center and Library, the American University School of International Service, and VMware Corporate Headquarters, among other projects. Burke lectures widely about eco-effective design and cradle-to-cradle thinking as the backdrop for the firm’s architecture and its work on guidelines, master plans, and other frameworks. Burke is a LEED Accredited Professional. Jonathan Knowles is an assistant professor of architecture at the Rhode Island School of Design (RISD). He has been teaching at RISD since 2001 and was project director for RISD’s 2005 Solar Decathlon entry. He has initiated a pilot project with the Department of Engineering at Brown University to conduct research into new forms of thermal electric systems. Knowles has taught at the Parsons School of Design, Cornell University, and Columbia University. He is also a practicing architect and passive house consultant in New York City, where he is a partner at Briggs Knowles Studio. The work of the firm has been published in several venues, including the New York Times and Dwell magazine. He is currently overseeing the design and construction of two net-zero homes in New England. His degrees, a Bachelor of Architecture and Bachelor of Fine Arts, are from RISD. Sarah Susanka is the leader of a movement that is redefining the American home and lifestyle. Through her “build better, not bigger” approach to residential design, she teaches that the sense of “home” we seek has almost nothing to do with quantity and everything to do with quality. She is the author of eight best-selling books, including The Not So Big House, Home by Design, and The Not So Big Life. In March 2009, Taunton Press published Not So Big Remodeling, in which Susanka shows readers how to remodel in a not so big way, making a house more functional, inspiring, and more sustainable. Her books have sold more than 1 million copies. Susanka is regularly tapped for her expertise by national media, including “The Today Show,” CNN, and The New York Times. In January, Builder magazine recognized Susanka as one of 30 innovators in housing over the past 30 years. She is a senior fellow of the Design Futures Council and resides in North Carolina. Richard Bourne is in “semi-retirement” as a half-time manager at the Western Cooling Efficiency Center (WCEC) at UC Davis, where he is responsible for retailer affiliate relationships and major research projects to reduce the cost of large radiant floor cooling systems. Bourne has served as director of WCEC, principal of Davis Energy Group Inc., and owner and manager of Solar Concept Development Co. Bourne has been a registered mechanical engineer since 1978. He has been a member of the American Society of Heating, Refrigerating, and Air-Conditioning Engineers (ASHRAE) since 1975 and served as a chairman on the Radiant Heating and Cooling Committee from 1988 to 1990. As part of his work, he has presented more than 150 special lectures, workshops, and technical papers on energy topics and has 20 United States patents. 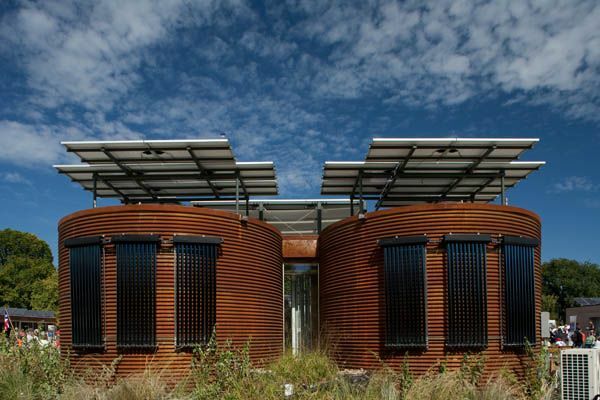 David Click is an alumnus of the 2002 Solar Decathlon and the University of Virginia, where he earned his Bachelor of Science and Master of Science degrees in electrical engineering. He then worked for three years at Solar Design Associates near Boston on residential and commercial projects, including a 600-kW system on a warehouse roof and the 120-kW photovoltaic systems installed at the San Francisco Giants’ AT&T Park. Now working for the Florida Solar Energy Center, he helps lead a week-long training course for aspiring solar contractors. He also serves as project support director, working with an affordable housing developer and the Florida Department of Environmental Protection (among others) on solar power and energy efficiency projects throughout Florida. Click also serves as a U.S. Department of Energy Tiger Team lead for several Solar America projects, including the City of Orlando and two showcases. He and his wife, Barrie, are the proud owners of a new 5.4-kW grid-tied photovoltaic thermal system. Ted Prythero is a principal in the Denver office of M-E Engineers, an international mechanical and electrical consulting engineering firm. Prior to M-E Engineers, he was a principal with Engineering Economics and a partner in ENSAR Group, a sustainability consulting firm. He has more than 30 years of experience in the design of HVAC systems, with an emphasis on energy conservation and applying innovative and alternative energy systems to buildings. Prythero also has extensive experience in energy management/control systems and energy analysis and has taught energy conservation seminars to design professionals. His interest has been working with other design team members to make more efficient envelopes and incorporate solar features into buildings. He has been involved in numerous exemplary energy-conserving buildings. He has received multiple awards, ranging from the U.S. Department of Energy’s Innovation in Energy award to the American Council of Engineering Companies of Colorado’s Engineering Excellence award. Prythero obtained a Bachelor of Science in engineering at Purdue University. James Ketter is the engineering manager for GF Development, an arm of the Southern Ute Indian Tribe in Durango, Colorado. He has extensive management experience in commercial and residential planning, design, construction, and operations and is a staunch advocate for sustainable communities. His current work includes the Three Springs project in Durango, a 2,000-unit, mixed-use, sustainably constructed traditional neighborhood development project. Ketter earned a mechanical engineering degree from Ohio State University, is a registered professional engineer, a LEED Accredited Professional with the U.S. Green Building Council, and member of the American Solar Energy Society. Ketter was a founding board member of the Durango Discovery Museum, a planned science and energy museum showcasing energy past, present, and future to be housed in the world’s oldest-known surviving AC steam power plant. Joyce Mason markets new home communities for Pardee Homes, one of the nation’s most prominent multi-regional builders. She developed Pardee’s LivingSmart® brand to promote energy and water savings, indoor air quality, and use of earth-friendly building materials. A member of the Building Industry Institute Advisory Board for California Green Builder, Mason earned The State of California Earth award for Pardee’s LivingSmart neighborhoods and habitat preservation in San Diego. Pardee Homes has received numerous sustainability awards, including the National Association of Home Builders’ Green Builder of the Year award, several Sustainable Community of the Year awards, and recognition from the U.S. Department of Energy, Environmental Protection Agency, and other local and regional agencies. She also devotes time to HomeAid. On its behalf, she coordinated display of a Pardee-built playhouse at the National Building Museum to teach children about green building. Paul Waszink is a construction cost consultant who specializes in the development of independent cost opinions via personal-attention investigative scope verification, quantity surveying, cost analyses, and related services for real estate development projects. As part of his job, he develops project budgets and cost estimates; provides peer review of construction cost estimates; offers project management at the sub-consultant, pre-construction, and course-of-construction phases of a project; works as a party appraiser in insurance settlement disputes; and provides training for groups and agencies about project funding budgets, cost planning, and monitoring. Nancy Clanton is founder and president of Clanton & Associates, a lighting design firm that specializes in sustainable design. She obtained her Bachelor of Science (in architectural engineering with an illumination emphasis) from the University of Colorado at Boulder and is a registered professional engineer. Clanton is chairperson of the Illuminating Engineering Society of North America’s (IESNA’s) Outdoor Environmental Lighting Committee and the Mesopic Committee and is a past member of the boards of directors of the International Association of Lighting Designers and the IESNA. Clanton is currently a member of the U.S. Green Building Council’s LEED Environmental Quality Technical Advisory Group. She was a topic editor for the IESNA Lighting Handbook, and her committee was responsible for the production of the IESNA Recommended Practice on Lighting for the Exterior Environment. Her firm has authored the lighting criteria for the Department of Defense Unified Facilities Criteria, the Colorado Department of Transportation Lighting Design Guide, and the exterior sections of California’s Title 24 2008 energy code. Ron Kurtz has been with Randy Burkett Lighting Design since 1990. His responsibilities as a lighting designer and project manager include the development of conceptual design, which involves the determination of both aesthetic and technical requirements, the preparation of contract documents and specifications, and construction phase coordination and field observation. His lighting design experience includes three years with Grenald Associates Ltd. in Philadelphia and Washington, D.C. Kurtz is an active member of the International Association of Lighting Designers, serves on the Sustainability Committee, and is a LEED Accredited Professional. He is also involved in the IESNA on local and national levels and participates on the Energy Management Committee. He is a member of ASHRAE’s 90.1 Energy Standards Committee and has been a speaker on a number of lighting topics at professional and educational conferences. Naomi Miller is the principal of Naomi Miller Lighting Design in Troy, New York. Lighting quality, the aging eye, health effects of light, dark skies, sustainability, and energy efficiency are her passions. She has many years of experience working in different facets of the lighting industry but finds lighting to be an ever-advancing field with creative challenges. More than 30 lighting design awards hang on her wall. She earned an undergraduate degree in architecture from the Massachusetts Institute of Technology and a Master of Science in lighting degree from Rensselaer. She chaired the IESNA Quality of the Visual Environment committee for eight years and was a principal member of the writing team for Light + Design: A Guide to Designing Quality Lighting for People and Buildings. She is a fellow of the IESNA, fellow of the International Association of Lighting Designers, and member of the Lighting Research Office’s Technical Advisory Committee. Maureen McNulty manages D&R’s outreach on behalf of the Partnership for Advancing Technology in Housing, a U.S. Department of Housing and Urban Development-administered program that works to speed the development and adoption of advanced building technologies. Before joining D&R, McNulty worked as an independent communications and marketing consultant and marketing director for an electronic communications firm. She also has six years of experience in program administration for an education association and several years as an account executive in public relations and marketing agencies. She holds a Master of Fine Arts in writing from George Mason University and a Bachelor of Art from Agnes Scott College. As the higher education sector manager at the U.S. Green Building Council, Jaime Van Mourik guides colleges and universities through the green building planning process and the implementation of the LEED Green Building Rating System. In this role, she directs the development of tools and resources for the sector and maintains customer relations for the council’s portfolio program. Prior to joining the U.S. Green Building Council, Van Mourik worked as a project manager at GreenShape, a sustainable design consulting firm, assisting more than 30 projects pursuing LEED certification. From 2002 to 2007, she worked at the National Building Museum developing, implementing, and managing educational programs about the built environment for an adult audience. Van Mourik is an active member of the building industry community, serves on the American Institute of Architects Washington, D.C., Inter-School Design Competition Committee, and is an Associate American Institute of Architects member and LEED Accredited Professional. She holds a Bachelor of Architecture from Virginia Tech and a Master of Architectural History from the University of Virginia. Alan Wickstrom is the president and CEO of BuildingOnline Inc., a Web site design and Internet marketing agency devoted to the residential and commercial building products industries. BuildingOnline designed and hosts more than 120 of the industry’s leading Web sites, offers a building industry search engine and Web site directory, and manages BuildingOnline’s eUpdate, a building industry newsfeed service. He has 20 years of business marketing experience in these industries as well as 14 years of Internet marketing and design experience. Wickstrom has a bachelor’s degree in marketing from National University, San Diego. He is an accomplished speaker on the Internet and in the building industry. Wickstrom is an active Rotarian, serves on the board of the Italian American Opera Foundation, and served as the foundation president of the South Orange County School of the Arts until June 2009. The Development Marketplace is a competitive grant program administered by the World Bank. The 2009 global competition is funded by the Global Environment Facility (GEF) and additional DM partners. It aims to identify 20 to 25 innovative, early-stage projects addressing climate adaptation. Development Marketplace – DM2009 – Climate Adaptation. The winners came from Sub-Saharan Africa, South and East Asia, and Latin America and the Caribbean. India, Mexico, Brazil, Ecuador, Cambodia, and Vietnam were each the home of two award winners. Altogether, 15 countries and Sub-Saharan Africa as a region were represented. The projects that made the final cut — from 1,800 applications that were winnowed down to 100 from 42 countries — promise to deliver a number of objectives and innovations to increase agricultural productivity, give farmers more land rights and link them to global markets, and, overall, reduce the deep poverty of rural regions in developing countries. All the grants are $200,000 or less — but the World Bank Group and other funders of DM2008 see even the smallest projects having a catalyst effect on lagging agricultural development that has been undercutting gains in the global fight against poverty. In her opening remarks, Katherine Sierra, Vice President of Sustainable Development at the World Bank, a DM2008 partner, complimented the winners on their “ambition and drive,” and said their innovation comes when it’s especially needed — amid the crisis of rising commodity prices. More compliments came from other speakers representing other partners — Mercy Karanja, Senior Program Officer of the Bill and Melinda Gates Foundation, and Albert Engel, Head, Division for Agriculture, Fisheries, and Food at GTZ. 1. Using Cassava Waste to Raise Goats, Nigeria, University of Agricultural, Abeokuta. To create a new market linking cassava producers and goat keepers through the introduction of a simple drying technology that will turn cassava waste into goat feed. As a result, the project will increase farming incomes and reduce carbon dioxide wastes by eliminating the need to burn cassava waste. 2. Converting Rice Fields into Green Fertilizer Factories, Ecuador, Escuela Superior Politécnica del Litoral (ESPOL). To increase rice yields and reduce dependency on imported artificial nitrogen fertilizers through the re-introduction and cultivation of the Azolla Anabena plant as a biofertilizer. 3. Linking Coffee Farmers to Markets via Traceable Coffee, Sub-Saharan Africa, Pachama Coffee Cooperative of Small-scale coffee producers. To support small farmers to obtain a greater share of the value-added in coffee production through the introduction of an online tracking system that will allow end consumers to trace a specific coffee back to the level of the actual farm. 4. Mini Cold Storage Ventures, India, Tiruchirappalli Regional Engineering College- Science and Technology Entrepreneurs Park. To establish cold chain enterprises among trained youth using the latest technology in refrigeration adapted to the needs of small farmers. 5. Renewable Energy-Powered Milk Coolers, Uganda, University of Georgia, To test a reengineered milk cooling system to match the needs of smallholder dairy farmers, resulting in reduced post-harvest losses and increased farm income. 6. Micro-Franchising Scheme for Agricultural Services, Cambodia, International Development Enterprises Cambodia. To develop a sustainable micro-franchise enterprise to provide affordable horticulture services through private extension agents. 7. Açaí Production for Income Generation and Forest Protection, Brazil, Centro Ecológico. To provide technical services to a local cooperative of small scale farmers in the biodiversity-rich Atlantic Forests to harvest and market the açaí berry. 8. Value Chain Development for Textile Products, Mongolia, VSO. To increase the domestic value of livestock production through better marketing opportunities and services to raw material producers and processors. 9. Organoleptic Analysis to Improve Market Access for Cacao Growers, Ecuador, Conservación y Desarrollo. To equip cacao growers with access to chocolate making machinery so that they can better serve differentiated markets and improve the quality of their product. 10. Ancient Cocoa: Modern Genomics Methods Benefiting Small Farmers, Trinida and Tobago, Bioversity International. To enhance the cocoa value chain by facilitating the identification of more profitable trace cocoa cultivars using modern genomics methods. 11. Riverbed Farming for Landless Households in Nepal, Nepal, Helvetas. To facilitate the use of leasing arrangements for landless households to gain access to unused dry riverbeds for off-season cultivation of horticultural produce. 12. Collective Land Ownership Model for Women, India, Manav Seva Sansthan “SEVA.” To demonstrate the effectiveness of a collective land ownership model that provides women secured land holdings necessary for them to adopt more profitable modern farming practices. 13. Legal Aid for Farmers’ Land Rights, China, Rural Development Institute. To create the first legal aid center in China devoted to farmers’ agricultural land rights. 14. Land Ownership for the Rural Poor in Mexico, Mexico, Agros International.To create two sustainable farming communities in Chiapas through the long-term lease of land and provision of integrated technical services to landless farmers. 15. Producing Biofuel from Indigenous Non-Edible Nuts, Tanazania, Africa Biofuel and Emission Reduction Ltd. To cultivate and sell an indigenous oil-seed for biofuel from the Croton tree, creating a new, sustainable cash crop for smallholder farmers. 16. Locally Produced Biofuel Outboard Motor, Senegal, Mission Goorgoorlu. To introduce along Senegal’s waterways an affordable and environmentally friendly mode to transport agriculture products to market. The project is using traditional vessels powered by a locally produced biofuel outboard motor fueled by processed indigenous oil seeds. 17. Agricultural Cooperatives for Biodiversity Conservation, Cambodia, Wildlife Conservation Society. To pilot Cambodia’s first market for payment for environmental services generated from agriculture using a “Wildlife-friendly” branding and marketing strategy. 18. Reducing Impacts of Ranching on Biodiversity, Mexico, Grupo Ecológico Sierra Gorda. To pilot a payment scheme for a “gourmet” menu of integrated environmental services generated from intensive cattle operations in the biodiversity-rich area of San Antonio Tancoyol. 19. Sustaining Nitrogen-Efficient Rice Production, Vietnam, University of Sydney. To establish an integrated production-supply-extension chain to ensure a reliable biofertilizer product that reduces chemical contamination and increases yields. 20. Low-Cost Housing: Waste Rice Straw Construction Panels, Vietnam, Vinh Sang Ltd. To create a sustainable enterprise that manufactures kits for affordable environmentally sustainable housing made from recycled straw waste in the Mekong Delta. 22. Payment for Ecosystem Services and Sustainable Agriculture, Paraguay, Organization of American States. To implement in three pilot sites a menu of agro-forestry practices combined with a scheme of Payments for Ecosystem Services. This will be the first application of Paraguay’s Law of Ecosystem Services in the context of a rural farm economy. Frequently Asked Questions About Agricultural Development – Bill & Melinda Gates Foundation. The Bill & Melinda Gates Foundation support programs that will enable small farmers to break the cycle of hunger and poverty—to sell what they grow or raise, increase their incomes, and make their farms more productive and sustainable. Employ a collaborative and comprehensive approach. Provide small farmers with the supplies and support they need to succeed. Put women at the center of their work. Help small farmers profit from their crops. Use science and technology to develop crops that can thrive. During the original Green Revolution, overuse of fertilizer led to unanticipated environmental consequences. Today, we consider potential environmental impacts in all of our grantmaking, and are committed to a sustainable model of agriculture that takes into account the needs of both farmers and the environment. So while Africa’s severely depleted soils require fertilizer, we promote judicious and efficient uses of fertilizer, and more intensive use of organic matter. We also invest in efforts to improve soil and water conservation techniques. Another unanticipated consequence of the original Green Revolution was increased inequity in some areas. Our work is focused on providing small farmers living on less than a dollar a day—most of whom are women—with tools and opportunities to lift themselves out of hunger and poverty. We and our grantees work to involve small farmers in the design and evaluation of our projects, to ensure that our work meets their needs and addresses the realities they face in their local areas. Another difference is that the original Green Revolution focused primarily on raising the yields of two staple crops: rice and wheat. Africa’s diverse agroecological zones and varied conditions will require a much greater range of approaches, from boosting productivity in a wider range of crops to developing crops that are resistant to drought, disease, and pests. We are working to carefully understand the different needs of small farmers throughout the continent and are designing our efforts to respond to their specific circumstances. This new Green Revolution is broad based and includes significant African leadership on a number of levels. We are working with a wide range of partners to strengthen the entire agricultural value chain—from seeds and soil to farm management and market access—so that progress is sustainable over the long-term. We are also working to involve and empower women—who are integral to success in agriculture—at every level of our work. Q: Do you pay attention to the environmental impact of your agricultural grantmaking? A: Yes—we consider potential environmental impacts in all of our grantmaking. Our approach is to support both poor farmers and the environment.Population growth and poor soil health in Africa have forced farmers to clear and cultivate more marginal lands, often leading to erosion, deforestation, and sometimes desertification. In Asia, the misuse of fertilizers and irrigation has caused large areas of land to be lost to acidification and salinization. We understand these are not sustainable ways to produce food or preserve the environment. In revitalizing small-scale farm production we are funding approaches that support small farmers and are ecologically sound. Q: Does the foundation promote the use of fertilizers? A: Healthy soil is critical to farm productivity, and the judicious use of organic and mineral fertilizers can help small farmers prosper while preserving their land.We support AGRA’s Soil Health Program, which focuses on integrated soil fertility management as well as the use of fertilizers where necessary to provide important plant nutrients missing from the soil and from organic materials available to the farmer. We invest in information and knowledge-sharing to assist small farmers in using the right fertilizers in the right way to nourish their soil. We also invest in efforts to improve soil and water conservation techniques. We are committed to sustainable agriculture, using farming supplies that farmers can afford and that take environmental needs into account. Q: What is the foundation doing about climate change? A: The foundation believes that climate change is a major issue facing all of us, particularly poor people in developing countries, and we applaud the work that many are doing to help find solutions in this area. While the foundation does not fund efforts specifically aimed at reducing carbon emissions, many of our Agricultural Development grants directly address problems that climate change creates or exacerbates. For example, we have made several grants to help small farmers who live on less than $1 per day adapt to increased drought and flooding through the development of drought and flood resistant crops, improved irrigation efficiency, and other means. At the World Food Prize in Des Moines, Iowa today, Gates announced that the Bill & Melinda Gates Foundation has awarded $120 million in nine new grants to organizations and research partners (including $15 million for the Alliance for a Green Revolution in Africa), to work on the effort, focusing primarily on small-scale farming in sub-Saharan Africa. In his speech Gates called for an end to the ideological division over the future of agriculture: “Productivity or sustainability — they say you have to choose. It’s a false choice,” he said. Rather, we need farming techniques that are both environmentally responsible and highly productive, and technology will help bridge the gap, he said. Today’s grants are being awarded for projects including distribution of legumes that fix nitrogen in the soil and pest-resistant sweet potatoes, training for African governments to “draw on as they regulate biotechnologies,” help for women farmers in India to manage land and water resources sustainably and programs to deliver information to farmers via radio and mobile phones. The awards come as part of the $1.4 billion that the Gates Foundation has committed so far for agricultural development efforts — promoting techniques such as no-till farming (explained in the video clip below), rainwater harvesting and drip irrigation. The Gates Foundation has drawn criticism, as the Seattle Times points out today, for focusing too strongly “on technology solutions and higher yields, a path that risks repeating the mistakes of the original Green Revolution.” But a growing number of firms, including startups and small companies, are working on a new wave of agricultural tech that could play an important role in a real green shift. via Bill Gates Wants a Green Agriculture Revolution: Here’s Tech That Can Drive It. Climate change is raising the stakes for agricultural tech as the world population grows and the amount of arable land shrinks. According to the Environmental Protection Agency, farmers will have to deal with “increased potential” for extreme events like droughts, floods and heat waves,” and “enduring changes in climate, water supply and soil moisture could make it less feasible to continue crop production in certain regions.” More mouths to feed, plus less arable land and changing rainfall patterns, means growing demand for tech that lets farmers do more with less. Venture capitalist David Anthony, founding partner of 21Ventures and a frequent co-investor with Quercus Trust, thinks that “aeroponic farming,” or farms in urban environments that use technology like LEDs to grow crops, will find a growing market. His firm invested in Aero Farm Systems, a New York-based startup that develops tech-heavy urban farming processes. In general, Anthony thinks that advanced farming techniques are an under-invested area where his firm sees promise. A slew of companies are also working on smart water management technology, and some of them could extend to agricultural applications. PureSense, for example, uses soil moisture sensors and sends data via wireless networks to irrigation control systems. Other companies are helping small-scale farmers bring their surplus foods to market using technology and the broadband age. Take FarmsReach, a California startup that won the audience choice award at our Green:Net conference in March. The 2-year-old company has developed a web marketplace to make it easier for buyers, such as restaurants, hospitals and schools, to order produce from nearby farmers, and for farmers to manage their sales and deliveries. Of course, the farmers and communities that the Gates Foundation is seeking to serve with these grants need low-cost solutions, and much of the technology emerging from startups right now still has a ways to go on the cost curve. As Pacific Institute co-founder Peter Gleick put it at this year’s Clean-Tech Investor Summit, “It’s entirely possible to create brilliant water technology that the places that need it the most can’t afford.” So we second the call from Gates for a “greener” revolution, with an extra nudge for startups to put technology to work for small farmers and the planet.